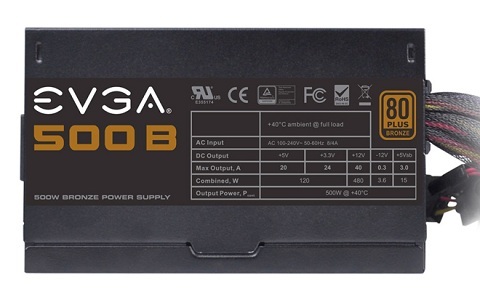 The EVGA 500 Bronze Power Supply is here. Designed with enthusiasts' needs as the priority, the 500 Bronze is the best choice to power next generation of computers. Combining 500W of continuous power with exceptional performance, stunning efficiency, and cutting-edge design and features, the 500 Bronze power supplies are what you need to take your system to the next level. 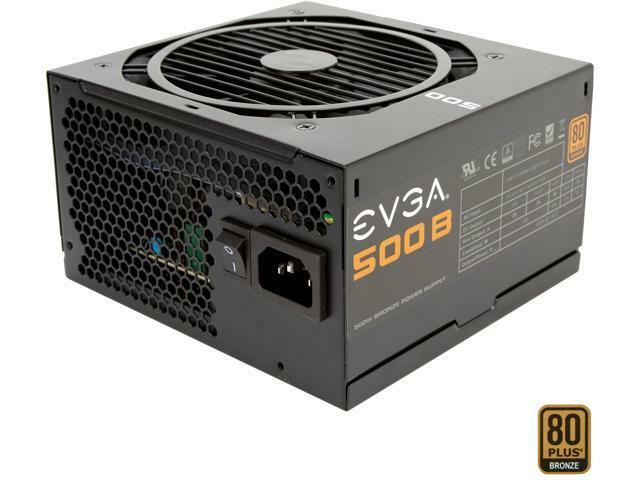 With price and performance in mind, the EVGA 500B is the best value power supply for your next build on a budget. 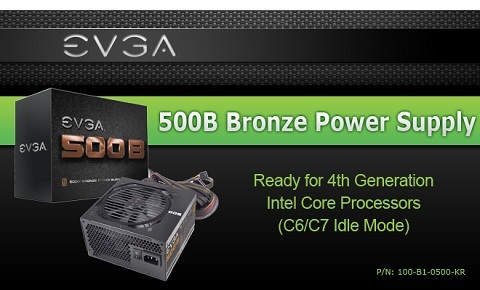 With 80 Plus Bronze standard, over 80% efficiency under typical loads, the EVGA 500B is a great choice. Combining 500W of continuous power and Single +12V High AMP rail design, gain maximum power and efficiency while staying protected with a series of over-voltage/over-current protections all bundled into one! Pros: good first impression but only lasted half a year. It worked great at first. I was glad it came with a free self tester which i did put to use. Cons: My computer just went out one day. I checked everything and it came to the psu. Thanks to the tester i was able to figure out the psu did die on me. Other Thoughts: I was very bummed out it didnt last, because this is my third build and everything has worked great, this is the first part to break on me and i didnt really find out why. I am in the process of contacting evga to see if it is covered in the warranty and i will write back on that experience. I do apologize for the troubles you are having with your EVGA 500 B1 power supply. I can assure you that we are here to assist and support you as best we can. If you haven't already done so, then I would encourage you to contact our 24 hour Technical Support team by phone 1.888.881.3842 and pressing option 1 or by email: Newegg@EVGA.com so that we can further assist you with warranty services if needed. Pros: I have used this power supply for about 3 years now and so far it has served me very well. A fairly robust unit that gets the job done. I've slammed my system with a bunch of components and despite this, the PSU has yet to falter. Cons: It is not modular, at least the 500B one, and there aren't any plugs for a floppy drive. Pros: The power cables are pretty easy to organize (zip ties make this look so satisfying). Lots of extra outputs for multiple GPU's and other PCI-E devices. Other Thoughts: More of a PSA than anything, but if you are looking on the low end for wattage for cost, just hop up to the next wattage. PSU's degrade over time and its not a good idea to have a top wattage just above what the components use. Find a wattage calculator before you pick up a power supply so as to not run into this issue. Just for reference, though, a very high wattage CPU combined with a high end GPU is gonna be hard on this PSU. Keep all of this in mind when picking out a PSU. Pros: Easy to install and have always bought EVGA power supplies but this unit is the first that I have bought and installed that has been truly unreliable. On very light duty no overclocking no extra graphics card power to motherboard sections failed. No issues with Newegg. Probably a good reason to buy Newegg extended warranty on any heavy postage items. Cons: 3 year warranty has a big gotcha. You have to pay postage before sending a RMA. Really is a "tuly limited warranty" for any sub 100 dollar power supplies from EVGA. Really makes no sense to pay more for postage for a 2KG RMA return package where postage is approx 43 dollars Canadian. Cheaper to buy new from Newegg when on special. Other Thoughts: No would not recommend this model to anyone. EVGA approved the RMA but 43 dollars to return the item makes the power supply proposition a throw away item. If you bought a high end unit then postage not the full cost of product to make a return. No issues with Newegg but disappointed in this particular EVGA product. I do apologize for the troubles you are having with your EVGA 500B power supply. I can assure you that we are here to assist and support you as best we can. If you haven't already done so, then I would encourage you to contact our 24 hour Technical Support team by phone 1.888.881.3842 and pressing option 1 or by email: Newegg@EVGA.com so that we can further assist you with warranty services if needed. Pros: It worked for 4 months. Cons: It worked fine, until it didn't. When I purchase an item, I expect it to work. I guess this is a disposable item? I wish products would say "This will only work for 4 months-then you will have to buy a new one." I'm interested in purchasing items that I don't have to replace after 4 months. Other Thoughts: Don't buy this. Buy something else. I do apologize for the troubles you are having with your EVGA 500B1 power supply. I can assure you that we are here to assist and support you as best we can. If you haven't already done so, then I would encourage you to contact our 24 hour Technical Support team by phone 1.888.881.3842 and pressing option 1 or by email: Newegg@EVGA.com so that we can further assist you with warranty services if needed. Pros: Lightweight Good Airflow, you cannot even hear the fan running it is so smooth! Cons: Not really a Con but it smells like an auto body paint shop really bad! Other than that not really a con, it runs and functions as it should. Other Thoughts: Buy it you will not regret it! Thank You Newegg and EVGA for a solid Power Supply! Cons: It only lasted 2 months of light use before failing. The supplied cord did not fit snugly in the power supply. This caused the computer to shut down unexpectedly if the cord was bumped. Luckily I had different cord that actually fit. Other Thoughts: Not sure if I would recommend it. Hopefully the warranty claim is a higher quality.